Long term fan of Michelin Pro Race 4. The usual excellent price and quick delivery from Merlin. So far so good. Wanted to give these a try after losing faith with previous Michelin tyres after many punctures. They seem to hold the road well and resistance is not noticeable. The innertubes were of no use to me as my wheels are deep rims, but will be used on other bikes. Terrific road feel. Bargain price because I don't mind riding last year's "best" product. These tyres wear very well, corner precisely and roll well. I have just replaced my previous pair of Pro 4 with the same after riding almost 5000km on them - only have to replace them after hitting a brick and pushing the front tyre out of shape. Really impressed with these, good in the wet too. Really good and comfortable tyres for an affordable price! These have been my standard road training tire for the past few years and they continue to serve me well. I really like these tires for their ability to stick to the road while not feeling overly sticky. These are a little more prone to cuts than the Continental Attack/Force I was using before but they still hold up just as well and last longer in my case than the Continentals. Have used Pro 4s and their predecessors for many years and found them reliable. Important to keep an eye on the sidewalls as recently had a small blowout. More likely to be due to the appalling road surfaces than the tyre. A favourite of mine, the pro 4 is tough and fast and long lasting too. Used these tyres before and never had any slips, slides or punctures whether rain or shine. Can't fault them and they give me plenty of confidence to push in corners. Pretty good tires. They are not Conti 4000s2's but they roll pretty good. Great tyres, but at an exceptional price. Bought to replace my lovely continental ultra sports, which were a lovely tyre but punctured TOO easily. These weigh less, are just as grippy and so far (500km), no flats!! One of the best tyres on the market. Doesn`t cut up as much as the pro 3, and so far no punctures after 500 miles, but no tyre is puncture proof. Roll well and easy to fit, changed to the wider tyre 700-25, and are better road holding and more comfortable. Shop around for best prices, as tyre prices can vary considerably. Very good prompt service by Merlin. Excellent tyres used all year round. Good long life and puncture protection. Love these tyres good wearing, hugs corners, easy to fit, roll well on all Tarmac surfaces, no slip in wet conditions. Great value for money. Have used Pro4 for several years and always find them durable and safe. Usual excellent value and service from Merlin. I have been riding on Michelin Pro tires for several years, and have been completely satisfied with their durability and road worthiness. I ride about 6000 miles / year, and can give my approval based on this experience. This price with the tubes included is a very good deal! Best tires for the money. Everyone and their dog ride conti's, but these are every bit as good and have less rolling resistance from my experience. I've been on 25mm tires for almost a year now and have only had one flat. Much better puncture protection compared to the Pro 3's. These replaced a set of Bontrager R3 tubeless with a very dramatic improvement to comfort. The R3 may have been harder casing to be effective as a tubeless but the PRO4 SC has reviewed well for puncture resistance. They may not be as fast rolling as the GP4sII but these are for the training wheels and I couldn't be more pleased. I train between 200-300km per week and find that the Michelin Pro4 Service Course are a puncture resistant and reliable tyre with a lifespan of 3000-4000k. Merlin always delivers on time! I've always been one for buying tyres on the cheap but I'm glad I splashed out a bit for these. Road handling is amazing. I feel so much more confident cornering at speed with these on. First ride out was a 300km audax but it's too soon to give a verdict on durability. I've been using the Pro series for a good 10 years now. Few tires can beat the Pro 4s for performance and endurance. Light and Fast. I tried Conti GP4000s II and this one. Both are great tires but I found Michelin Pro 4 Service Course feel better for my riding preference. I'm light weight (137lb) and I like more stiff and feel the road. This tire give me this feel. I only give 4 star is because this tire is not as durable and I get about 2000~3000 miles with it if I'm lucky. I get about 2000 miles out of these tires. This is my 4th pair this year, they seem to be ok in the rain but I am still very careful the stripes on the road are very slippery no matter what tires you have. I like these tires as much as Continental GP 4000s. They last as long too. Sure grip in the corners. Last pair I had, had zero flats. Had my last set of these for about 7 months now, with slime tubes, never had a flat or puncture to date. Great tyres. My train, race, do everything tyres. Seems to be very light and grippy, although a bit vulnerable to glass. I have done approx 100 miles on these. They feel firmly planted on the road and give plenty of confidence in corners. Let's hope they last longer than the continentals I replaced. Only had a few rides, but the extra volume of the large 25mm (in fact, looks like 28mm!) already feels great on the road. Hope they last as long as my usual 25mm Conti GP4000S. These tyres are proving to be very good quality at a great price. I am getting good mileage out of them in tough North Queensland conditions. These tires look nice on my Mavic Kysrium rims, but they are slower than the conti GP4000IIs I've been riding. The rolling resistance for these tires is higher than the contis, but I went with them because the Contis seem to experience sidewall cuts all too easily. They seem to be a little narrower than the Contis, They measured 23.7 mm wide after inflation while the Contis always measure greater than 24 mm. Other reviews said these were a bit softer ride, but they seem harder to me,. We'll see if they break themselves in. This is my second pair of pro4's, very happy with the ride. Similar in feel and grip to the conti 4000s. I have noticed that this pair is actually wider on the rim than my last pair, not sure why but it might have something to do with why there is now a version 2 out. Same performance though. Look great and installed super easy on my wide wheels set (23 mm wide rims). Roll smoothly. Much quietter, softer. Better grip than Lithion 2. The differences are far more than its price. I put this 0nto my wheel last week end. I had good grip and feet confortable. This is a good tyre that I have now bought and replaced my Ultremo ZXs, these feel more comfortable and look good on the bike, however I do not think they roll as well as the ZXs. Excellent price and usually speedy service from Merlin. A huge improvement to my last set of tyres. Lithion 2. Didn`t believe the hype, but yep they roll so much easier. Have PB's coming with ease with them. Would highly recommend you get these. 3rd set of these now and not had any problems with them. Great tyres. These tires are fantastic... I will be ordering more ! Great tyres in wet or dry, fast rolling and perform well at 120psi. Recently used in Soaking TDY 142km Sportive with excellent results, improvement over pro race 3. Great tyre , quick running and the reason I bought these was because I wore my old pro4's out . Really good tyres, lighweight, grippy and no punctures yet! Great product at a great price! I love these tyres, racing and training they feel smooth, supple and secure. I wasn't too sure about the white walls but they look pretty good and the supplied tubes even had long enough valves for my 38mm rims! All in all a great deal from merlin. I swear by these tyres and Merlin had a great deal bundled with some tubes - so a no-brainer really! Not only are the tyres durable, they are super grippy in all conditions, and they roll really well. Coupled with the fact they come in several different colours, I think Michelin are onto a winner! It was good quality tires, and durability, grip on wet road surface also good working. Of course, rideing feel on dry road surface was perfect. I like it. Good: Very comfortable ride feel. Easy install. Bad: Not durable. Great tires at a great price. If you are looking for performance in a clincher, this is it. For a long wearing tire, you might look elsewhere. Excellent tires - fast rolling, great traction and comfortable ride! Great tires. Amazing cornering. I feeling the road. Very stable with no compromises. I recommend to bicyclists. Very, very safety ride with them. This is my third pair of PRO4 tyres. I weigh 85kg and the rear squares off after 2,000-3,000km. They also cut fairly easily and need regular checks for glass. But that said, their grip in the dry and especially in the wet it's outstanding. They feel fantastic and supple on the road. Great tyres with a shorter life trade-off. Great tyres, great price and fast delivery. Have fitted all my bikes with these tyres having tried other brands. I wanted tyres with grip and easy to mount. These are exactly that! I bought these as replacements for well worn Continental GP4000s 23mm -still going strong but looking very tired. First things, the price at Merlin for a pair was very good, and delivery was quick. I ordered them in 23mm black, I was surprised after fitting to see they were noticeably narrower than the GP4000s - despite both being labelled as 23mm. It was a concern as the Continentals give a harsh ride on my alu framed bike, its worth considering the 25mm. It was tougher to fit these on my rims than the Continentals, but could be done by hand, I bought some light weight Michelin tubes and there was little room between the rim/tube/tyre, not something I would like to change often out on the road, but I do find modern tyres very puncture resistant these days, I get about 1 or 2 flats a year running 3 bikes. A few test rides later and all seemed well, just done the Etape Eryri (104mile/8000ft) and again the performed very very well, more supple than the Contis, and seemed more comfortable, despite being narrower, I suspect they may not be quite as robust come winter, but I plan to keep these for better days. Certainly saved a few grams, and very happy with them. This is my second pair. They roll and corner great, even in wet conditions. Really grippy and comfy, a good improvment over the pro3'S! A classic, the Michelin Pro Race have always been very nice tyres. The pro4 roll well, have good puncture resistance and are good for over 2000 mi. They are not as aero as the Pro4 Comp, but roll and feel better with the same pressure. These have unleashed a beast in my bike! Previous tyres were specialised armadillo elites.....stuck these on my Mavic Ksyrium Elite wheels. The bike just took off. Took 12 mins off my 40 miler PB and I ran out of gears on the big descents which has never happened before. The roads near me a are great so less chance of a puncture but we'll have to see. So far, incredible speed from these tyres. Great Value and performance. Roll nice and smooth. These roll so well, racing last weekend was a joy (well apart from the physical exertion). Fast cornering is never under doubt and they feel completely solid. I get a new set every season - so difficult to say what wear is like - but I haven't had any problems. Great value from Merlin. Just ordered my second set. Current tires have 2,000 miles, and might give another 1,000. 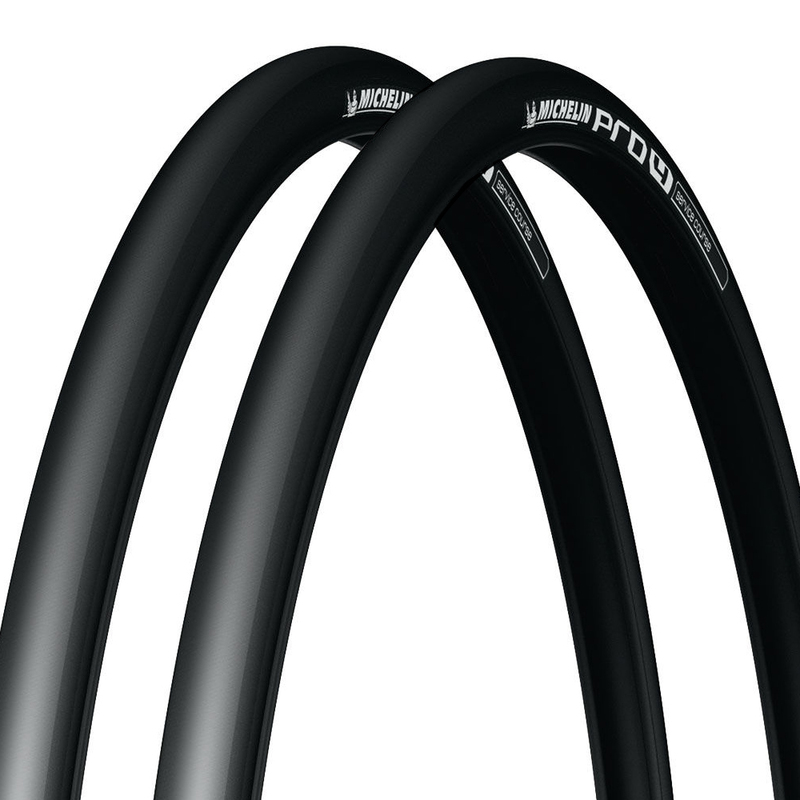 Pro 4 tires seem to be more resistant to flats than others I have used in this price range (Hutchinson, Vittoria). Grip is very good. Ride is stiffer than the aforementioned, but not by much. I tend to be rather hard on tires, and am quite pleased to get this kind of mileage. I am using the Michelin pro 4 and I just found no reason not to keep using it. It performs great at all conditions and the most important - it's light in weight! Pro 4 Service Course is the best tire I have ridden by far. Michelin just keeps getting better and better with their pro race series. After riding on Continental 4000 tires for years I'll never go back after using these Michelins for a season. Very smooth and absolutely NO cuts in my tires after 4000klms. They wear well and are great in the rain. I did rotate the front to back after 1500 klms which definitely helps the wear factor. Nice looking on my ENVE rims as well. Used these tyres to ride Les Grandes Alps from Geneva to Nice and had no problems on either the ascents or descents. Early days as far as durability is concerned (I found the Pro 3's too fragile on poor roads) but the comfort, grip and rolling resistance are excellent. A great tyre for racing, low rolling resistance and super grip on corners. To get the best out of these tyres use Michelin Latex inner tubes, a more than "marginal gain" for only a few extra quid. Excellent, with somewhat better grip (Especially in wet) compared to the Conti 4000s I have been using in the past. Merlincycles fast as always with shipping. Nice tyres, look good and light. Appear to be a bit more robust when compared to Schwalbe Ultremo's which I also own and roll as well. Good feeling of corner grip. Recommended. Superb quality tyres. Excellent grip in wet weather. I would buy this product every time. pro 4 race.. nothing to complain.. just get it.... no regret. Light, run well. Seem to have pretty decent mileage too. Thought I'd give these michelin tyres a try when I was due to renew my tyres and I'm glad I did. I didn't think I would notice any diference from my last, budget, tyres but you definately do. They roll superbly and have lots of grip. Against the stop clock they are a lot quicker. Glad I made the upgrade. can't comment on endurance as I've only just got them, fingers crossed. So far so good, can't say anything bad about these tires, a little hard to put on the rim but it's not a big issue. Slick French Rubber My second pair of Pro 4s. Great feel and grip. Good wear; about 4500 km on country roads. Running on them now for a week, first impression a bit firmer than 4000S but positive feel, good cornering seem good in wet. Happy so far. very good grip very light and long lasting buy it now! Lightweight tyre, slightly stickier than the Pro3, longevity still to be seen but seems good to date with several rides over varied road qualities. Needs to be inflated to 120psi at all times to get the best results in both rolling, grip and durability. Always come back to Michelin. Had Schwalbe Ultremos, Vittorria Open Corsa and Continental and never as happy as I am with Michelins be them Pro 3 previously or even Axials i think it was before that ! First pair pf Pro 4s and all good so far. I have realistic expections about life expectancy of these tyres based on previous incarnations which will be similar to the other brands I've used but I'll be much happier with the performance during that time. Unless they wear very quickly I'll be using these for quite a while. As for Merlin...... cheapest prices and fastes delivery (next day and free) and they don't offer things in awful colour options at dead cheap prices as a lead in to get you to look at items and then show you the real price for the items in a decent colour....... unlike some other well known bike websites ! Ok ? Can I go for a ride now ? Another good quality product Michellin Pro 4 race (service coarse) folding tyres perfect for the weekend warriors and sportive riders plenty of grip and quick with the added bonus of longevity.Fitting these tyres are like most folding there a little tight to get on the last part of the rim ,but with a little bit patience you can roll them over the rim with your thumbs don't be tempted to use tyre levers or your be asking to get pinch punctures! Fantastic service, ordered online on a Friday and arrived half way round the country on Saturday morning. Good grip and robust for a supple tyre. Great Tires - truly - highly recommended. This price is wonderful in the tire of the newest highest. The grip was also good, and in order to also absorb vibration of a fine gap,the fatigue by a long ride decreased.